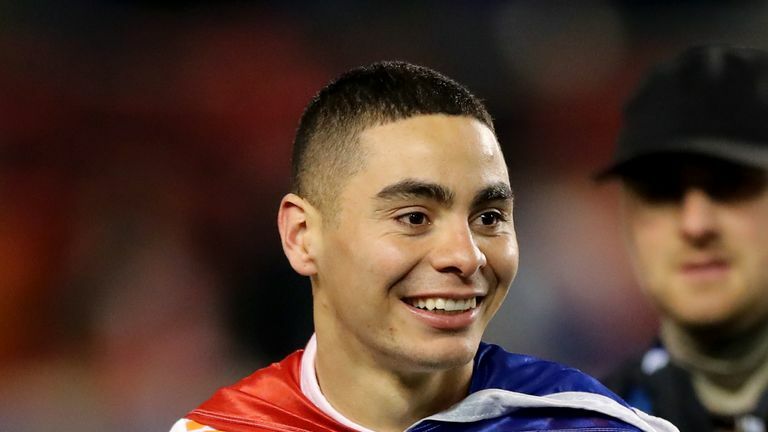 Rafael Benitez is confident record signing Miguel Almiron can fulfil his potential in the Premier League after completing his move to Newcastle. Almiron, who has 12 caps for Paraguay, has been a long-term target for Benitez and the Spaniard is delighted to have finally gotten his man. "We were following Miguel Almiron for a while and we saw a player with some pace in attack who can play behind the striker," Benitez said. "We have someone who can score goals and give assists. "We were following Miguel Almiron for a while and we saw a player with some pace in attack who can play behind the striker. We have someone who can score goals and give assists." Almiron, who began his career with Cerro Poteno in his native Paraguay before heading for the United States via Argentinian side Atletico Lanus, was twice named in the MLS Best XI during his time in America. Asked if he is fazed by his club-record fee, Almiron told Sky Sports News: "I am very happy to be here and I just want to work together with the manager. I don't really think about the numbers, that is not my thing. Almiron's arrival was confirmed hours after that of full-back Antonio Barreca, who has joined the club on loan from Monaco until the end of the season with an option to make the move permanent.